Sometimes, the ugliest food is the tastiest food and this is definitely one of those times. These Mexican Beans are great on their own just served with some rice or tacos on the side but they’re super great with this tasty taco-cheesy topping. It’s cheap, easy and mexi-magic! You can make the beans in the Thermomix or on the stove. 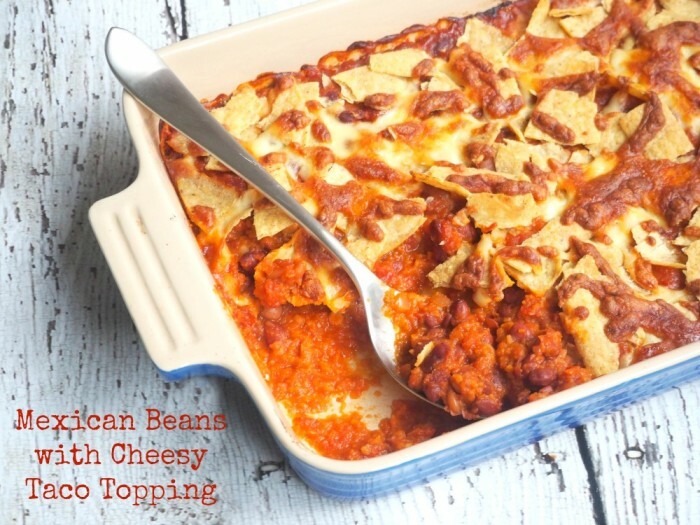 I often make the beans ahead of time, then add the topping and pop into the oven for an instant-winner-dinner! Don’t be put off by the long list of ingredients because this recipes is easy as! Preheat the oven to 190C/fan-forced 170C. Heat the oil in a large pan and cook the onion, carrot, garlic and chilli for about 10 minutes on medium heat until onion has softened. Add tomato paste, stir well, then add the cumin, coriander and smoked paprika. Stir fry for a minute or two. Add chopped tomatoes, capsicum and soy sauce, bring to a simmer, then cover and leave on a low heat for 10-20 minutes, stirring occasionally, until all the veggies are cooked through. Add all the beans, stir, bring to a simmer, cover and cook on a low heat for 10-15 minutes until the beans are hot. If the mixture is getting too dry add a couple of tablespoons of water. Transfer the beans to an ovenproof dish and scatter with the taco pieces and sprinkle with cheese. Bake for 30 minutes or until the cheese has melted and is bubbling hot. Add the beans, tomato paste, tin tomatoes and soy sauce and cook for 17 minutes at 100C on reverse + speed soft.